Irrational Games co-founder Jon Chey is taking his leave from the studio in order to build a brand new one. Given that his resume boasts titles like BioShock and System Shock 2, odds are pretty good that you've at least heard of a game Jon Chey worked on and quite probably consider it one of your favorites. It may come as some surprise, then, to learn that he's left the developer he helped found, currently at work on the upcoming BioShock Infinite, in order to start up a brand new venture, called Blue Manchu. "You have little pieces on a board, and you play cards to move those pieces around, and that's the battle you fight. And at the end of the battle you win some treasure, which you then use to trick your characters like you do in an MMO, but those characters are actually pieces in the board game." Card Hunters as of right now is a Flash game, but there is a chance that Card Hunters will be released as a downloadable client to the iOS. This upcoming title will offer competitive multiplayer experience that will use an micro-transaction model to sell vanity items but not cards; cards will solely be given to players by playing the game. 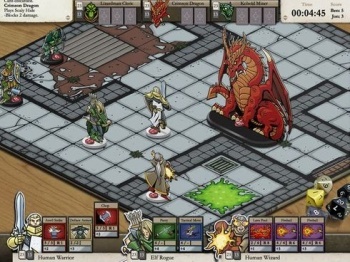 Card Hunters is set to be released early next year.